From white sand beaches and classic cars to cobblestone streets full of pastel homes and horse-drawn carriages, Cuba is a photographer’s paradise. Elderly men serenade you with their guitar while smoking a hand-rolled cigar as women saunter by in brightly-colored dresses and wide-brim hats decorated with flowers. On this small group tour to Cuba, not only will you be able to capture your own unique photos, but a professional photographer will also be on hand to give tips on how to take great pictures and to capture high quality photos of everyone in iconic places around Cuba. This group trip to Cuba will be extra special because it marks the 500th anniversary of Havana and it is quickly selling out. Reparations on the Havana Capital building will be complete, new museums will open, special concerts and parades will fill the streets, and new pedestrian-only promenades and a public bicycle system will be completed. As Instagrammable photo-ops have driven scores of people to incessantly take photos of Cubans without asking permission, locals have, understandably, become more withdrawn to photographers. This Cuba photo tour is not about sneaking photos of Cubans before they can object. This Cuba trip is for travelers who want to authentically engage with local Cubans; learn about the island’s culture, history, art, music, and architecture; and to create meaningful connections, all while capturing once-in-a-lifetime pictures. This is a fast-paced, action-packed trip, geared at curious travelers that enjoy non-traditional, off-the-beaten-path, local travel experiences. It is perfect for travelers who avoid run-of-the-mill big bus tours and who like to see and do a bit of everything. Throughout the trip, you will meet Cuban friends of mine who will share their experiences as artists, journalists, government employees, entrepreneurs, and documentary film makers. These unique experiences will explore a side of Cuba that few tourists see. Arrive in Havana, get settled. Neighborhood orientation tour and stroll along the bustling malecón, where all of Havana congregates at night. Evening drive in a classic car to watch sunset from across the bay. Full-day historical walking tour of the Museum of Revolution and surrounding Old Havana historic hotels, churches, plazas,elegant mansions of one-time wealthy merchants, and Havana’s growing graffiti and street art scene. A professional photographer will accompany the group to share tips on how to take great pictures and to capture photos of everyone in iconic places. Salsa dancing by the ocean. 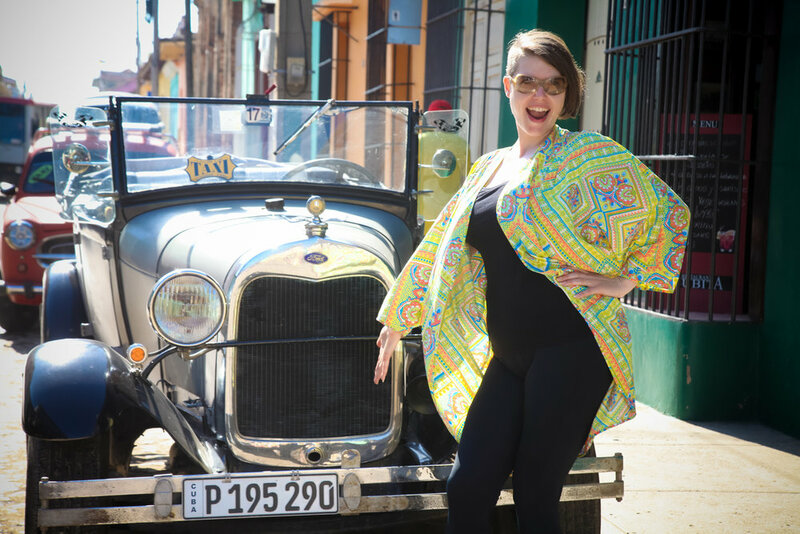 Morning history and culture tour of Havana in a classic car to iconic places, such as: Revolution Plaza, Old Havana, “The Forest”, and a community arts corridor. A professional photographer will accompany the group to capture photos of everyone in iconic places. Afternoon discussion with an American journalist who’s been living in Cuba for 17 years and operates a business there. We’ll learn about her experience as an American living and running a business in Cuba and about her role as a journalist covering Cuba’s health and education systems, LGBT rights, among other topics. Evening visit to an old factory converted into the country’s premiere exhibition arts space and nightclub. Four-hour drive to the colonial city of Trinidad. Stop in the French-inspired city of Cienfuegos for a city tour and lunch in an old palace. Afternoon culture, history, and religion tour of Trinidad with local journalists. Evening visit to enjoy a live Afro-Cuban music and dance performance. Morning city photo tour with a local photographer to capture photos in both classic and largely unknown locations around the city. Afternoon visit to the beach. Morning historical tour of former sugar refineries, plantations, distilleries, and slave quarters. Optional zip-lining opportunity. Four-hour drive back to Havana. Evening is free for live music, dancing, packing, or resting. Morning free for last-minute shopping or a private photo tour with Cuban professors of photography. Pricing includes all activity admission, round trip airport transfers, transportation between and within cities, guides, B&B accommodations, all breakfast, and either lunch or dinner each day. Travelers with special diets (vegan, vegetarian, gluten-free, Kosher) can be accommodated with advanced notice. Contact me for more information! *Prices are based on double-occupancy. If you wish to have your own room, please add $399 per person. In the past, guests have enjoyed inviting friends and family to share a room, though I will try to pair up interested singles looking for a roommate. A 50% deposit is required by the indicated date to reserve your spot. The remaining balance is due by September 15th, 2019. IMPORTANT: Proof of travel insurance is required for this trip. Read my article Why You Should Buy Travel Insurance to learn why it’s so important. You may chose your own travel insurance provider but I recommend World Nomad's. I've used their insurance for many years, as have many of my clients, and they offer comprehensive coverage and excellent customer service at a reasonable price. Additional terms and conditions can be found here. See my previous blog posts to help you plan your upcoming trip to Cuba and to get a feel for the day-to-day life that few tourists encounter. For more information to help you decide what places you’d like to explore during your time in Cuba, see my previous blog posts to get a feel for the day-to-day life that few tourists encounter, what to pack, what to expect, and what to know.